Remember last time when I talked about this clothes site I saw? Well, don’t ever buy from them! Cause Angie and Aud bought so much and the clothes didn’t fit at all! Thank god I was still stingy then and chose not to buy those overpriced clothes. Actually right, I’m a fan of online shopping. I loveee to look at clothes site for hours and NOT buy anything! hahahah damn stupid but it’s a hobby ok. Haih I can’t go shopping often here so looking at clothes online is like window shopping without all that walking =D How fun! Ok continue. So anyway I was once a fan of selltrade kl cause they have cheap 2nd hand clothes but after buying some stuff from people, I wasn’t really satisfied so I moved on to bigger things. I tried shopaholics and clothesbucket and a million other clothing sites but seriously they all have the same stuff! 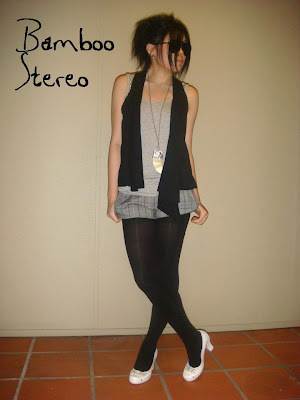 So super sien ok I don’t wanna wear the same stuff everyone in KL is wearing! Let me show you some examples of their clothes. Damn nice until dunno what seriously! This is simple but damn nice leh! I never liked bubble skirts but this is soooo cute! This pinafore is 149104 times nicer than what the other clothing sites sell! I love how it’s pinstriped and I love the buttons and how it’s sorta like a bubble dress? damn damn nice! I like the whole look! Damn cool and chill wtf. I’m on the lookout for that kinda shorts. This is what I bought! I love it so much! EH actually I’m so stupid! I didn’t want to share my ilmu wtf but as you can see, the clothes are from bamboo stereo and I actually linked them in my sidebar. 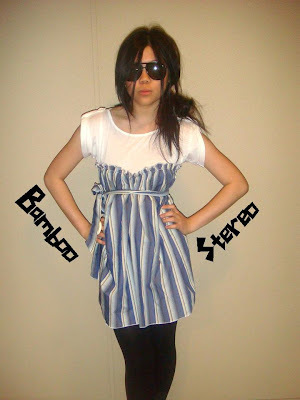 Haih so now you know, these clothes are all from bamboostereo! I love their style! How often do you see people wearing all that? Kinda vintage but not really that vintage until it’s old, kinda classy, and kinda casual. After spending a million hours deciding the life or death question on which one I should splurge on (since their clothes are not thaaat cheap so must carefully pick right), I actually find myself veering towards that style when I shop. Trust me, that site is sooo addictive so be careful! I don’t want anyone to email me saying they spent their entire fortune on clothes thanks to me wtf. Another site I like more compared to the rest is misswishful’s friend’s site I think. It’s called lunalola or something. They have pretty decent stuff and rather affordable too. But their clothes are not as unique and stylish as bamboo. Ah, so spoilt for choice! Haih kids these days so lucky. Back in those days, we have to waste money and gas to go to malls but now they can just buy clothes online tsk tsk.